Unlike other travel destinations, the best time to visit New England is during Fall Foliage, which is during a very small window of time. You run the risk of missing what most have called a beautiful phenomenon by traveling either too early or too late. We are always on the same page with the operators as well as other organizations so that you may enjoy the best New England has to offer during this short and impactful time of year. As a high-volume seller of travel, we are provided with the opportunity to be one of the first to receive a full list of available dates from several of our top tour operator partners. Timing is everything, especially when it pertains to booking a Fall Foliage tour of New England. These particular dates are only available for a short time once they're released, which is why we suggest starting your planning stage at least six months in advance, so you have your space(s) confirmed. We are not in the business to simply process your deposits, we're in the business of keeping your best interests in mind... Knowing the best time to travel New England during Fall Foliage and successfully booking you on that date in order for to receive the best outcome is what we do. We're in the business of you returning and referring your friends and family. Also knowing with who to travel with in order for you to receive the best experience is part of our job. As consumers we're often looking for the best deal we can find without losing out on the service aspect involved in the transaction. It's one thing to to know Amazon is offering the absolute best deal on a widget, especially if you're signed up for Prime. You're paying less and you're getting it in two days. However, when you're talking about big ticket items like TRAVEL, you're going to have questions and make changes. We provide healthy discounts without it affecting the service to you. When you think of 2018 Fall Foliage Tours, the first things that come to mind are autumn, cool weather, New England, winding roads, unique stores and an array of fall colors (red, yellow, purple and brown.) Travelers come from all around to experience the crisp, cooler temperatures and the great outdoors. From Maine to Massachusetts, tucked away in colonial villages, seaside villages, crystal clear lakes and cobbled streets, you’ll find the quintessential New England, the core of America and the essence of our history. Autumn's crisp chill and vibrant colors provide the perfect backdrop for a visit to New England. Now planning your Fall Foliage vacation is even easier, as we have done all the work for you. There are so many ways to travel while in New England. Choose from Escorted Tours, New England Vacation Packages, Rail Journeys and New England Fall Foliage Cruises. 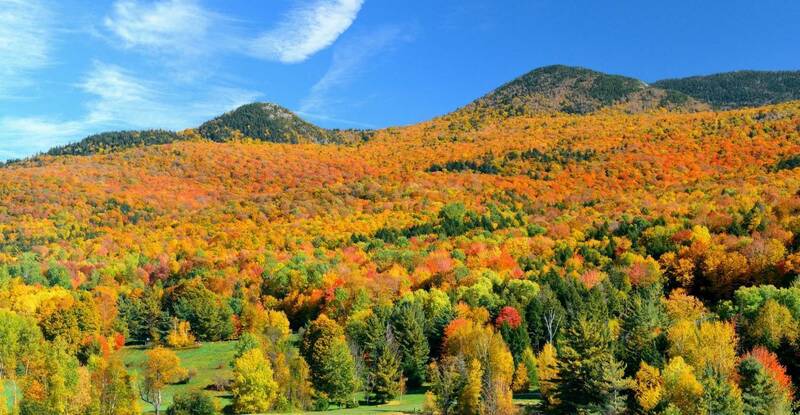 Fall Foliage Tours can not only save you money but provide the best value for traveling to New England. The main difference between traveling through New England during the Fall Foliage and anywhere else in the world is timing… When planning your 2018 Escorted Fall Foliage tour, you must first realize that Fall Foliage occurs during a small window of time. If you wait too long, you’ve missed it, and if you arrive too early, well you’ll miss it. This being said, and knowing what you know now, the best time to plan a tour like this is a year in advance. You should then plan to be booked nine (9) months prior to your departure. It’s really as simple as that if you wish to confirm your space and purchase the least expensive airfare. Due to the narrow window of time, space is normally sold out within six (6) months of peak fall foliage, and by this time airfare can be in the $500.00 per person area, which is what you want to avoid. PLAN FOR A 2018 FALL FOLIAGE TOUR NOW! Very Professional - great follow-up. All my questions were answered immediately. I was very happy with the customer service. The overall service from Alex exceeded our expectations. He was very efficient and had great attention to the details of our trip. When i plan my next tour, I will use Alex and Atlas again. I just love your chief programmer that lives in Lakeland. He&#039;s just amazing.